Learn how to how to find the specific numbers for the CDL In-Cab Air Brake Inspection. Watch the video. Hi there smart drivers. Rick with smart drive test talking to you today about CDL air brakes, passing the test, and knowing the five in-cab checks that you have to do. And the specific numbers that you have to memorize for the purposes of passing your CDL road test. So that's we're gonna help you with today. Stick around we'll be right back with that information. Hi there smart drivers. Welcome back. Rick with Smart Drive Test talking to you today about the CDL air brake in-cab checks that you have to do. 4) testing the compressor, which is often referred to as the build-up test. 5) And then building to maximum pressure and doing your leak test. And those are the five tests you have to do in-cab. And I have a checklist over at the Smart Drive Test website that's going to help you with that and memorizing those numbers. 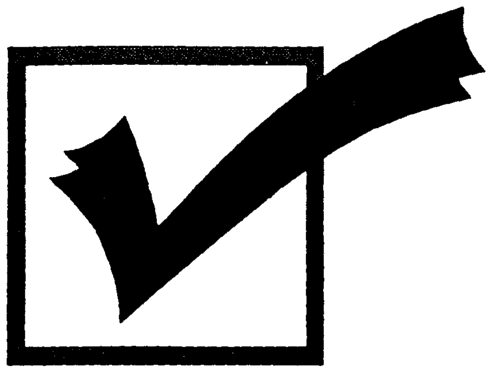 And if you check down in the description there, you can find a link over to the Smart Drive Test website where you can pick up your checklist for the in-cab CDL air brake checks that you have to do. Now just before we get started here, Smart Drive Test helps new drivers get a license, veteran drivers to remain crash free, and CDL drivers to start a career as a truck or bus driver. So if you're new here, consider subscribing. As well, hit that bell, that way you'll get instant notification of the videos up for you. What we're going do here is I'm going to pull up some of the manuals in the United States in the different states there and go through the manuals and show you how easy it is to do a search of the manual and fill in the specific numbers that you need for your state and put them on the checklist. And then you'll have those specific numbers which you can transfer to your flash cards. 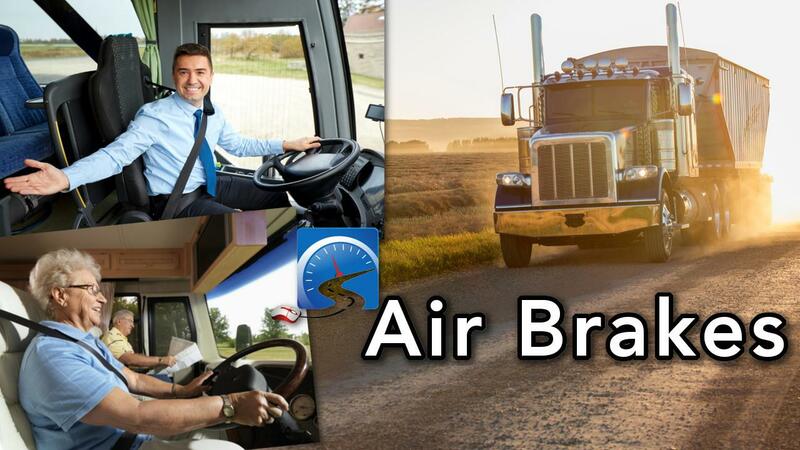 As well, over at the Smart Drive Test website, we've recently released "Air Brakes Explained Simply" which is a manual that will help you to pass your CDL air brakes test. And as well, you can find that link down in the description. So at the computer here. 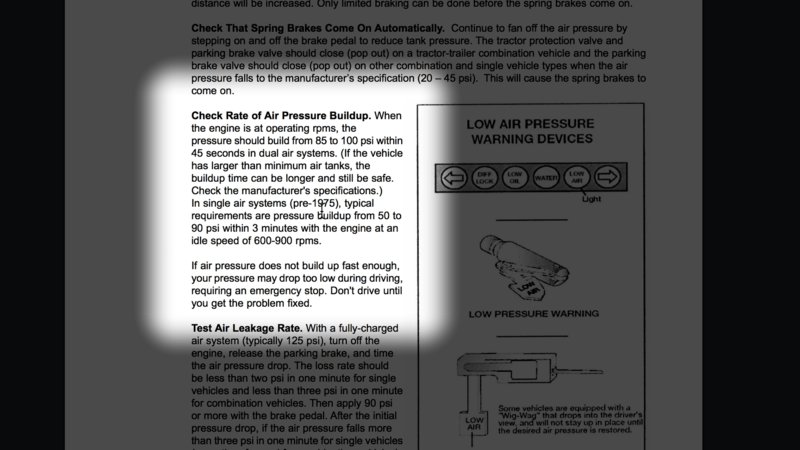 We're looking at the worksheet that I've created for you to do the 5 in-cab air brake checks that you need to do. And those consists of the governor test, the low air warning test, testing that the emergency brakes apply between 20 and 45psi. So these two tests will be combined. And then the compressor tests, and the leak test. Those are the five tests. Now some jurisdictions, like the province of Manitoba here in Canada, have also made another check: that the trailer air supply valve pops out above 50psi. And you might have to check that for your jurisdiction. But for the most part, most states in the US and most provinces in Canada, the trailer air supply valve and the emergency brake apply between 20 and 45psi. So that's going to be one test. So that's how we get to that. So let's look up the governor test. And we head over here to... just get out of this page here. 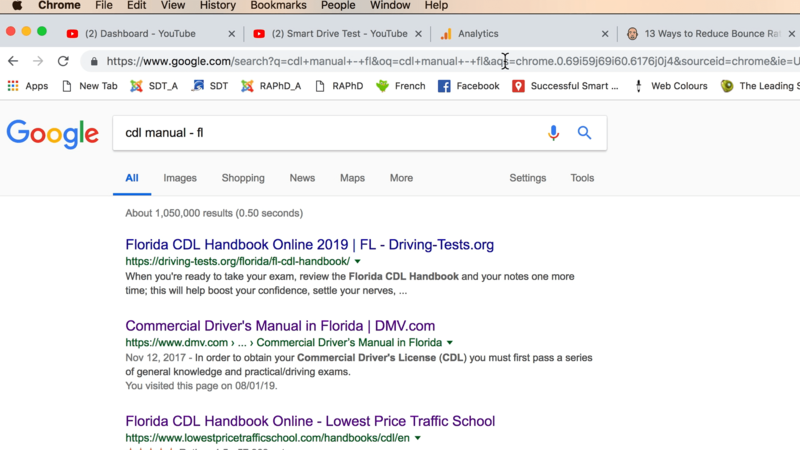 And we go over to Google and we look up here.. and we go CDL - CDL manual. And we'll pick California. CA is the short form for California. It pops right up at the top here. We click on this. All of these are searchable, these manuals - the CDL manuals. So we go up to edit and we go to find and search the document. And we get this up here. And we go governor - spell that there. Click - we've got 15 different ones. So there's air compressor governor. So this is not the information that we want. So cut out is approximately 125psi. That's not the piece of information that we're looking for. This specific piece of information that we're looking for... here we go. Air compressor governor cut out pressure test. This performed test [READING] the air compressor should cut out no higher than 140 pounds per square inch. That is for the purposes of your test - that it has to cut out before hundred and forty psi. So that's what you would write here in the maximum here. You would write 140 pounds of pressure for the governor test. Now we got to find the minimum for this as well. And see if we can find this? Keep clicking down here at compressor to cut in pressure. So here's the cut in pressure. This must occur no lower than 85 pounds for a bus and no lower than a hundred pounds for truck. You got to figure out whether you're driving a bus or a truck. If it's a bus, it's 85 pounds per square inch and if it's a truck it's hundred pounds. So we head back over here. And now we're going to the low air warning and now we'll look at Texas. 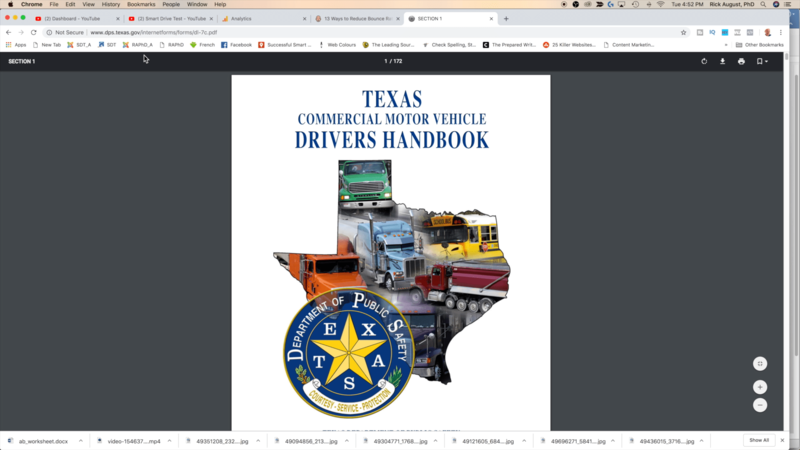 So we'll go CDL manual - click over there - put TX for the short form for Texas. CDL manual comes up at the top. And we search. Edit and find low air warning - AIR... there we go, low air pressure. Okay and an automatic wig wag. So it talks about wig wags in the system. Above sixty pounds. So it has to be above sixty pounds. So you go back over to your checklist here. Low air warning - it's above sixty. So you would write sixty plus psi in here for the low air warning. Now this one here, as I said, trailer air supply button. Just have a look for that in your jurisdiction. The only jurisdiction I'm aware of is Manitoba, Canada. Most of these, it's just going to be the emergency brake apply, which is going to be the trailer air supply valve and the parking brake valve on the dash. The red and yellow buttons are going to pop out. So we're going to go and look up CDL manual. And we're going to go to the state of Florida. The third-largest... most populated state. So second one is the commercial driver's manual in the state of Florida. And I've already been here and I know that these two links don't work. So I'm just going to go back here. Sometimes that's going to happen. You click around and you're going to find that the links don't work So it didn't work on this link here. The links were dead. Somebody needs to contact them. walk-around... No we're not looking for walk-around. Check air pressure build up. Spring brakes come on automatically. This is the test. And they must come on between 20 and 40 psi. So you go back to the checklist and you put that in here for this one. And this one here. So 20 to 45... 20 to 45 pounds. The next one we're going to do is the compressor test or often called the build-up test. So we'll go back here and we'll go to the next state which is the state of New York. [TYPING] So CDL Manual...NY is the short-form for New York. Here... and there's me with some of my CDL stuff. CDL drivers manual and we go down here - looking for air brake section five. Click on section five and we'll go control F... buildup. No, inspecting air brakes during walk-around test, low air warning check, check pressure build-up. So here we go. So see, typical: it's 50 to 90 but for this... if engine is operating at operating rpms which is probably about 600 rpm in a large diesel engine. Time would be 45 seconds, and RPM would be 600-700 RPM for the compressor test. And the last one we're going to do is, we're going to do the leak test. And this is going to depend on whether you're doing a single unit--bus, truck, or trailer. So CDL manual. 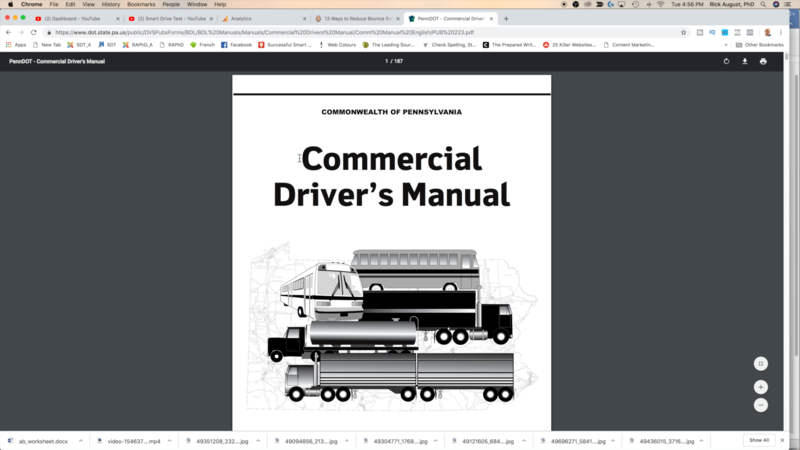 And we're going to go PA for the state of Pennsylvania's commercial driver's manual for the state of Pennsylvania. And we go here and we're going to look for leak test. We get 105 search results. Here we go. Air leakage rate with a fully charged system, typically 125 pounds. Turn off the engine, release parking brakes. The loss rate should be less than two pounds in one minute for single vehicles. Less than 3 pounds in one minute for a combination vehicle with air pressure build up to the air to governor cut out of 120-140 pounds. Alright so we've got two pounds and three pounds. So we go back to our checklist here. And for a single unit we're going to check that. And we're going to put two pounds...[POINTING TO CHECKLIST] sorry two pounds under pressure loss, and we're going to put the amount of time is one minute. So that's how you fill that out according to the different CDL manuals. So that's how you fill out the checklist. And you can find that down in the description. I'll also put an infograph that's available over at the Smart Drive Test website. 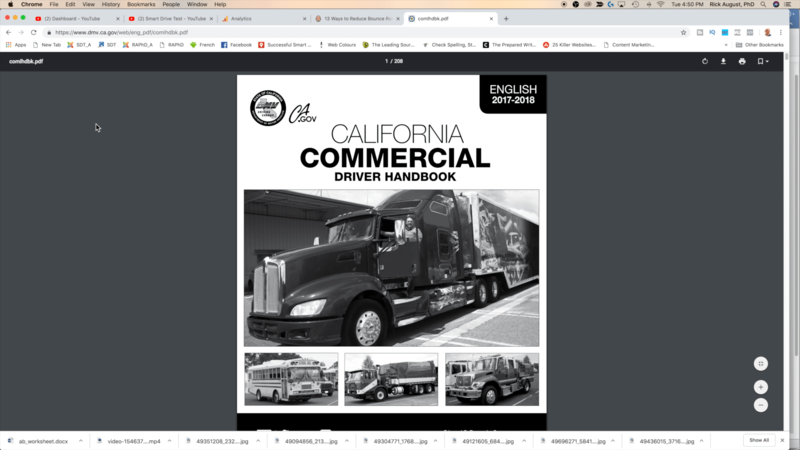 Use the infograph in combination with the checklist and that will show you how to do the in-cab checks and the sequence that you need in order to be able to do that successfully for passing your CDL road test. As well, over at the website I'll put the link down in the description there if you're interested in "Air Brake Explained Simply" book. That will give you all the information you need to be successful on your CDL air brakes. Thanks very much for watching. I'm Rick with Smart Drive Test. And remember, pick the best answer not necessarily the right answer. Have a great day. Bye now.